Sometimes the murder isn't the mystery. Dogboy, aka Bronson Black, is Colta City's 13-year-old superhero. After defeating the Guild of Thieves things have settled down for the mangy masked crimefighter… until he sees local businessman Dexter Stonehouse gunned down on Liberty Pier. When it appears an old family friend might be involved, Dogboy jumps into action to unmask a killer. Does he have the guts to expose a man from his past, or will he ignore the evidence to learn more about his strange powers? Meanwhile, girl reporter Cindy McNeil has a secret, and along with three other teens she's hatching a plan to fight City Hall. But can Cindy lead a revolution without Bronson finding out? The story was fun and interesting, but the characters was what made this story for me. Dogboy is a budding superhero, but still has this innocence that is endearing. I'm eagerly waiting for the next story! Superhero Dogboy is on the job! Who are the good guys? Who are the bad guys? Did Bronson witness a murder? What kind of stuff is his friend mixed up with? Why is dad's partner trying to sell their stuff? What's happened with his superpowers? Will Bronson be murdered? Guess you'll have to read the book to find out! NB's performance adds color and depth to the characters, and enhances the writing. Where does Dogboy: Danger on Liberty Pier rank among all the audiobooks you’ve listened to so far? it was an excellent and professional read. So well done I forgot I was being read to. What was one of the most memorable moments of Dogboy: Danger on Liberty Pier? When Cindy reveals a secret to bronson. Have you listened to any of Nathan Beatty’s other performances before? How does this one compare? This was my 2nd. First was Den of Thieves. Excellent reader for the character of the book. Bronson during the finale and the things he says and does. Bronson Black reminds us that being a Hero means something and Bill Meeks does another wonderful job of weaving morality tales and timeless adventure into another highly entertaining read. This is a great follow-up book to the first book in the series. We are getting more back story and exposition. I can not wait to see where this is all headed. Bronson and Cindy are a dynamic duo, sort of, every couple has issues. So she is hiding the fact she has super powers, I have faith they will stick it out. The overall story this time gets more into the underbelly of the city, still not fully clued in on the Mayor. I expect this will be dragged out through a few books. I really like the added supporting cast and can not wait to see more of the AV crew!! I listened to the audiobook narrated by Nathan Beatty, who does a great job. The voices this time around were all distinct and consistent. I enjoy the energy he infuses into the read. Great pace makes the story really flow. I would recommend this book for both middle grade boys and girls. It might have more of a boy feel, but there is plenty engage girls as well. Disclosure - I received a copy of this book in exchange for an honest review. All thoughts, ratings and opinions are my own. Dogboy Wins Again! He's an Official Superhero! 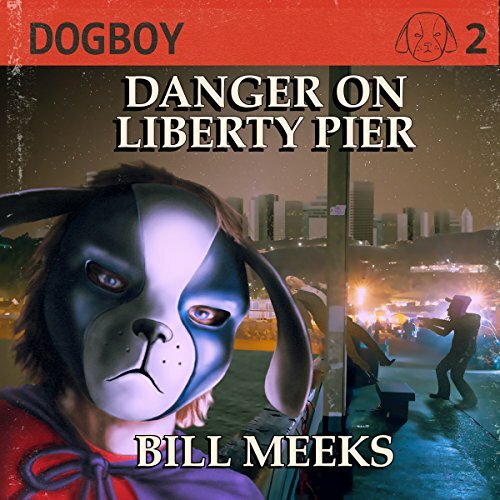 Would you listen to Dogboy: Danger on Liberty Pier again? Why? Yes I would listen to 'Dogboy: Danger on Liberty Pier' again because I think it's really neat. I like this series a lot and find it very entertaining and easy to listen to. One of the most memorable moments for me was when Bronson's dad's old partner Wiley Morgan comes into the Magic shop. What does Nathan Beatty bring to the story that you wouldn’t experience if you just read the book? Nathan Beatty brings Bronson, aka Dogboy to life. He does all the characters and is amazing with his voice. He has an emormous amount of versatility. Dogboy jumps to life through audio as well. Yes it was and although it isn't necessarily a long story, I like to take my time and enjoy the ride. It's fun and adventurous. I hope there will be more Adventures of Dogboy in the future. This is adult/young adult and I could easily see this as a late evening TV series.I received this audiobook free of charge in exchange for an unbiased review.